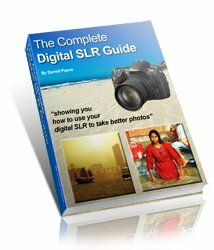 I am a student and novice in digital photography. I took this photo with Canon a480 small digital camera 7.1Mp. The camera was kept on Snow mode. This pic was taken when I was travelling in train in Switzerland. My main focus was on landscape .... tree with background mountains …. just to have beautiful desktop wallpaper. What wonderful scenery. And here’s a really good tip – always take your camera if you are taking a long rail trip. Trains have a habit of getting to the places that roads can’t. And don’t worry about taking photos through glass – if the glass is clean, and you get the lens close to the glass (to minimise reflections), you should be ok.
Back to Yusuf’s photo – the snow mode has really helped here. Cameras have difficulty in properly exposing snowy scenes like this. They are set to average an exposure of a scene to 18% grey (in terms of light and dark tones, not the actual colour grey). If your scene isn’t 18% grey, they can struggle. If you have a snow mode, use it, because it forces the camera to overexpose from that standard 18%, and the result is the whites stay white! If snow appears grey in your photos, it’s because the camera has used it’s default setting. Luckily with digital photography this can easily be corrected by brightening the image later, using software. 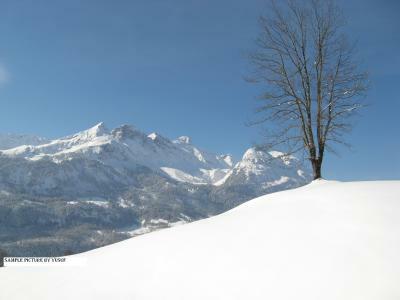 The scenery captured here is good – a nicely placed tree (importantly, not in the middle of the photo), some foreground interest (the snow), the mountainous backdrop, and a perfect blue sky. If there’s anything I would change, it would be to give that tree just a little more space. It looks like the very top branches have been lopped off. If we could have given them a little space at the top of the photo it would have been better. Admittedly, if the train was moving, there won’t be much time to retake the shot. The only other thing that spoils this is the "sample picture by Yusuf" plastered across the photo. I’m not sure why Yusuf put this on (we credit your photos here, provided you enter your name in the submission box), and it just spoils it. Apart from that, this is a great photo. Thanks for the submission. Want more tips? Get our recommended eBook. this winter photo has given warmth to me. Return to Digital photography tutorials - submissions, March 2008.